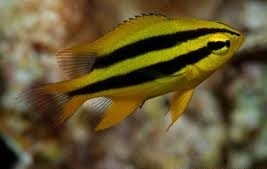 The Black and Gold Chromis is normally found as solitary individuals on coral-rich areas of lagoons and reefs. 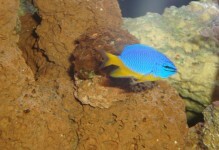 It is most commonly found in areas with high densities of stony corals. Juveniles are found singly or in loose groups while adults are solitary. 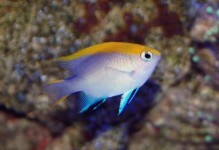 The Black and Gold Chromis becomes noticeably more aggressive as it grows. 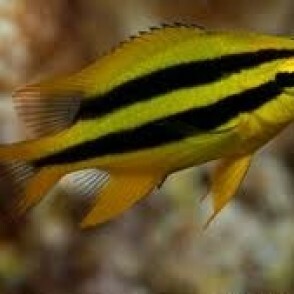 It loses its stripes and becomes two-tone, dark in the head region and yellow to the rear. 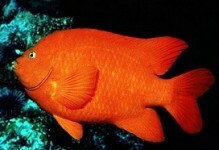 It is a hardy aquarium fish but it should be kept with aggressive tankmates as it matures. 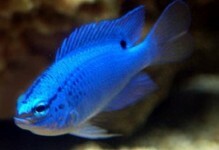 Only one Black and Gold Chromis should be kept per tank.